1. Why are gut strings so expensive? 2. From which sources do we know that the strings of the string quartet were thicker than those we commonly use today? 3. How important is, as far as quality is concerned, the colour of gut strings? 4. Is it true that strings made of ram’s gut can be recognized by their (typical) brown colour? 5. Is it true that strings made of lamb’s gut are better than those made of sheep’s, beef’s or ram’s gut? 6. 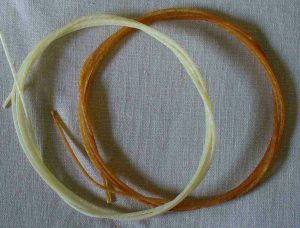 Why do modern stringmakers use guts cut into strands instead of whole guts? 7. Why can’t I use historical gauges on my violin/viola/cello? 8. 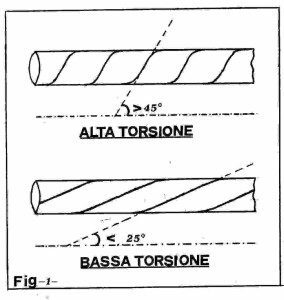 What is the difference between a high twist and a low twist string? 9. What is a semi-rectified string? 10. What care do gut strings require? 11. How do you make the loop knot? 12. What care do wound strings require? 13. What is a string’s quality test (so-called Mersenne’s test)? 14. What is a string’s Breaking Index? 15. What is the acoustical lower limit of a gut string? 16. How do I measure a string’s diameter? 17. How were strings sold in the past? 18. Why are gut strings sometimes varnished? 19. What care should be taken with the nut and bridge grooves? 20. 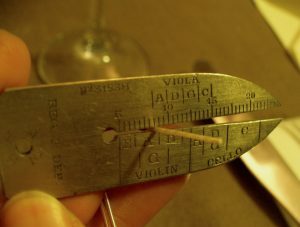 I checked the diameter of a gut string a noticed that it sometimes is slightly different from that declared on the string envelope: is the string faulty? 21. How should I store my strings? 22. How do I take care of “buzzing” in historical wound-on-gut strings? 23. How should I prepare a lute to be strung with gut? 24. What is the Working Index of a string? 25. What is Nylgut® ? 26. What were typical string quartet stringings in the 18th and 19th centuries? 27. What are the technological differences between modern and historical would strings? 28. What sort of wound strings were in use in the 17th to 19th centuries? 29. Why can’t we consider equal tension stringing a historical option? 30. What should I do when I put a new string on? 31. What should I do when I am not going to play for some time? 32. What is the difference between historical and modern stringing praxis (violin, viol, cello)? 33. How do I work out the right working tension? 34. Why do my strings “whistle” under the bow? 35. Why did the string break as soon as I put it on the instrument? 36. I used a Venice string as treble: why did it break immediately? 37. I put DE type wound basses on my lute but they seem to be a bit dull compared with other wound strings. Why is that? 38. I put on my instrument a Venice type string of the same diameter as the previous high twist plain gut and it feels much slacker: why is that? 39. Is it true that in the 19th century wound on gut core strings were used on the Guitar? 40. I tried some Venice type as bass strings on my Bass viol, but I am not satisfied since they sound very dull (especially the sixth does): why is that? 41. Is it true that in the 19th century wound on gut core strings were used on the Guitar? 42. I tried some Venice type as bass strings on my Bass viol, but I am not satisfied since they sound very dull (especially the sixth does): why is that? 43. Is it true that a sharply bent string completely damaged? 44. My instrument has a ‘wolf’: what can I do about it? 45. I though that giving you the diameter of my wound string for replacement, but I heard that is useless: is that true? 46. Why did it take so long for the strings to arrive, this time? 47. How to install demi-filé (open wound strings)? These strings have been developed according to historical knowledge we acquired after years of researches. Because of the spacing between the coils of the wire, this kind of string is extremely delicate. During the first tuning it is therefore suggested to keep the string lifted a few mm up above the nut groove and the bridge and to let it go only when you are almost at the required tuning. Due to its nature, tha spacing of the winding does not allow scrolling of the string in the nut grooves. In this way the risk of damaging the wire is eliminated.